This Could Go All Wrong » « At What Point? So, you hop in your ship and make some long jumps to a nearby black hole. What I always love is placing the black hole between myself and the galactic disk, then doing a slow fly-by on a near collision course. Due to simple matters of scale it doesn’t make much difference if you’re looking at a “small” black hole, or a supermassive – they all look pretty much the same to something our size. It’s like an ant surveying an elephant – an adult looks pretty much like a baby when all you can see is a vast expanse of elephantine foot. The survival of such experiences is a great big macguffin: since we’d presumably be dealing with heat and xray energy (?) that was extremely high, a black hole would be a very dangerous thing to get anywhere close to. 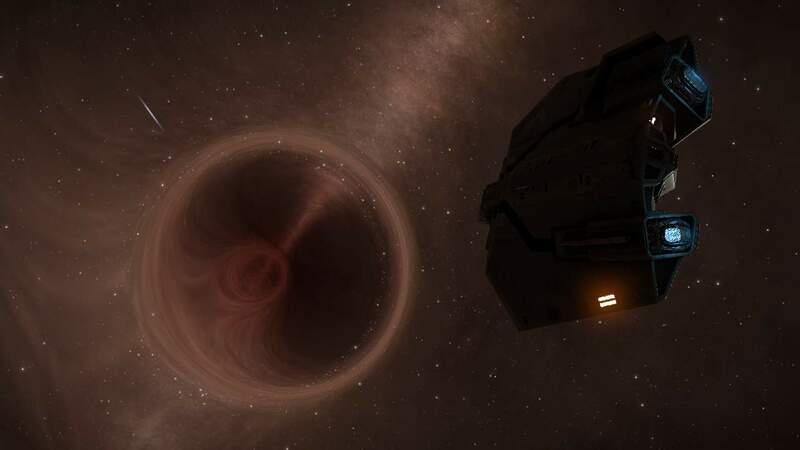 I seem to recall somewhere that Larry Niven pointed out that, because of the inverse square effect of gravity, as you get close to a black hole, you’d have a tremendous difference in the g-forces between a distance as small as your head to your feet. I think that’s a nice way of saying your spine would separate as you were turning to a flattish blob on the floor. Science fiction often depends on violation of physical law; otherwise the stories would be either very short, or very long (usually with an abrupt ending). After all, humans will almost certainly never be able to travel to anything like a “nearby” black hole. I think the nearest to earth is about 1,000 light-years away – something like that – humans will not travel that far just to visit something that we can be pretty sure what it looks like and there’s no point in visiting, anyway. We’d just die. I seem to recall somewhere that Larry Niven pointed out that, because of the inverse square effect of gravity, as you get close to a black hole, you’d have a tremendous difference in the g-forces between a distance as small as your head to your feet. I think that’s a nice way of saying your spine would separate as you were turning to a flattish blob on the floor. With larger black holes, tidal effects wouldn’t be a problem close to (or somewhat beyond) the event horizon. But of course you would still face other problems, such as burning up in the accretion disk. If you were very lucky to find a big, non-rotating one that’s in a completely empty region, you would just fall into it unceremoniously. It wouldn’t be long before you’re dead, but until then, the trip would be pretty boring. Neil DeGrasse Tyson calls the process you described “spaghettification.” So more like spaghetti and not so much an amorphous blob. There wouldn’t be a pushing against the floor of your spaceship, like you’d experience when firing the ship’s thrusters, assuming you’re both just falling. Both you and the ship would become a thin, noodley stream of atoms, and that would probably ruin your day. Owlmirror, the dark spot is a sort of “shadow” created by the black hole, which is larger than the event horizon itself. I don’t know the exact figures, but I read somewhere that it’s around two or three times larger. (If it were rotating more slowly, it would be closer to the same size.) That may still put it outside of Pluto’s orbit, sounds about right… not the whole solar system, if that’s meant to extend as far as Oort cloud. That’s unimaginably big. And it’s mighty dense, too! After all, it produces such a gravitational pull an entire galaxy of 400billion stars orbits around it. It blows my mind. 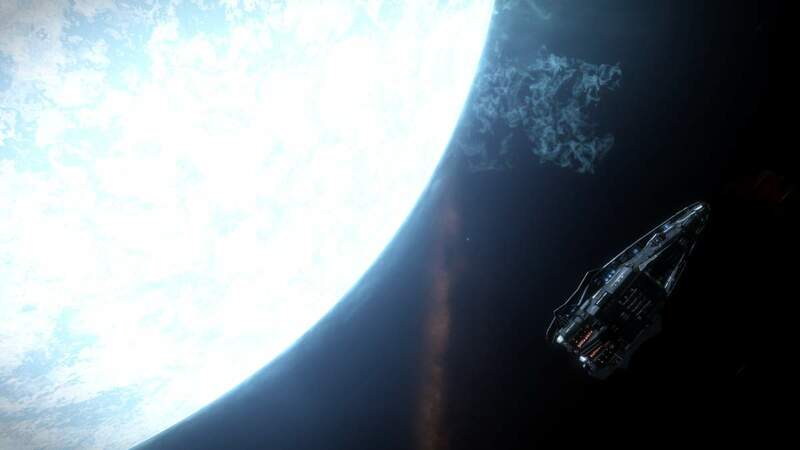 Like many players in Elite, I made the trek to SagA* and that was where I noticed the problem of scale. So, the monster is the size of our solar system? It looks the same because I’m viewing it from a greater distance. If I viewed any black hole from twice as close (if I could) it would look bigger. I’m not describong that correctly, so maybe I am not making sense. Ah: to fit it all on the screen I have to be farther back; any blackhole that fills my screen looks screen-sized because that is my reference. The other story I always liked was Pohl’s Gateway. The idea of Klara frozen in relative time as she fell into the black hole… it still gives me shivers.